Hilltop Farms is known for high quality landscape design and a wide variety of plant material. The crocuses have been up early this year, the air is warming up quickly, so what should you be doing to get your garden ready? 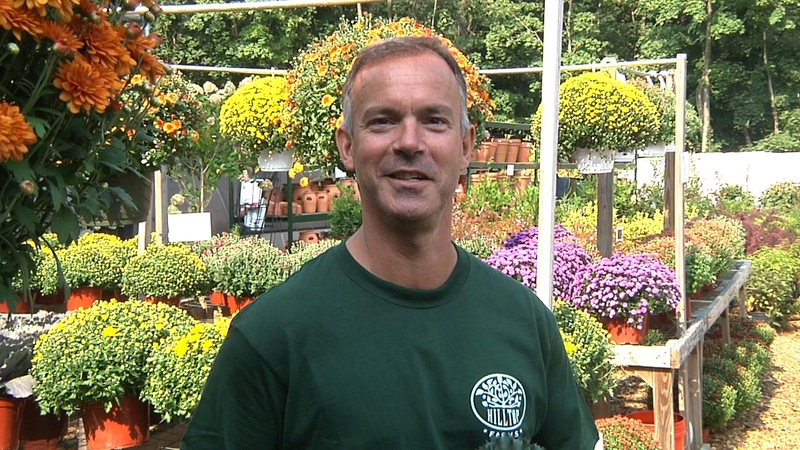 Brian Panessa, owner of Hilltop Farms Garden Center in Croton-on-Hudson, offers some tips. One of the easiest things to do while you're waiting for the ideal planting day is to clear any leaves or debris that have gathered in drainage areas over the winter. Seedlings always do better in soil that drains well so now is the best time to clear specific areas before bushes and trees begin to sprout. You can use any decaying material for composting. Early spring is an excellent time to rake the lawn and begin to introduce light and air into the soil for stronger grass growth. Add lime to your soil if it has a pH below 6.2 as it should be added several weeks before planting. Re-seed areas that need it by using a metal rake to break up the hard bare areas and give the seeds ample opportunity to grow and be sure to water often. Spring is also a good time to transplant any bushes, trees or shrubs because of the relatively consistent moisture in the soil. Be sure to dig down under the root ball to avoid cutting any roots and place the plant into a large enough hole to back fill with soil, compost and organic fertilizer. Start looking for, and removing, early spring weeds. Roots are shallow now so they are easier to pull. It is also a good time to mulch in any bed areas that are bare to minimize the growth of weeds. Be sure to spread to a thickness of 3-4 inches. Some gardeners use this time to put down plastic sheeting to reduce weed growth, then mulch on top. Remember to keep mulch a few inches away from young trunks to reduce the possibility of rot that could occur around small trees and shrubs. While we had a mild winter this year, we were hit with that ferocious October snow storm last year and many trees and shrubs suffered broken limbs and trunk damage. Now is a good time to assess the damage and properly deal with any branches or bushes that have experienced a break of some kind. If you have an established bed, don't dig; you could disturb a complex ecosystem which is already functioning well. Instead add nutrients from the top and let them work their way down into the soil. If you have perennials in that garden however, this is a good time to split or divide them while roots are still short. There are several early spring vegetables that you can plant once the ground is free of ice crystals. Peas, spinach, and lettuce all do well planted early. After 2-3 weeks you can plant broccoli, cabbage, kale and other hardy vegetables. Remember to cover anything you plant early with some protection should a frost be predicted. This is also an excellent time to plant bulbs. Early spring gardening can go a long way to ensuring you have a healthier and more robust landscape this year. According to various studies, well done landscape design can improve a home's value by up to 12% and homeowners can see a 100% - 200% return on their investment. For landscape design ideas and outdoor living environment options, contact Hilltop Farms in Croton on Hudson at http://www.hilltopfarmsmarket.com or call 914-358-1531. Enter to Win a Garden Makeover from Hilltop Farms! Hilltop Farms located in Croton-on-Hudson is looking for a garden in need of a makeover. To kick off the spring gardening season, they will select one Westchester resident to receive a complete garden bed makeover valued at $2,500. To enter, send a photo of your garden and in 200 words or less indicate why you feel your garden should be selected. Submissions should be sent to info(at)hilltopfarmsmarket(dot)com or they can be dropped off at Hilltop Farms located at 2028 Albany Post Road. Entries must be received by May 1st. The winner will be announced on Mother's Day, May 13th at Hilltop Farm during their Mother's Day Tea on the Porch event. Questions should be directed to 914-358-1531. Learn how to prepare your landscape for spring, how to sow an edible garden, plant early spring vegetables and cold crops, and how to feed your evergreens. Bonnie Rogers, local Herbalist & Wellness Coach, will discuss developing a healthier lifestyle through the use of herbs including growing medicinal herbs, herbs for digestive and anxiety support as well as growing culinary spices. Earth Day Workshops For Kids and Adults! Celebrate Earth Day at Hilltop Farms. Join Tony from Jonathan Green for an Eco Friendly Lawn Care workshop and at the same time the kids can attend My First Garden workshop where they'll create their own little garden in an 'eco-friendly container'. Learn how a well planned and effective landscape design can actually improve your home's value by up to 12% in a one hour workshop. Bring photos of your home's site for a brief consultation. A lively discussion on how to create a landscape you love and one that deer won't! Topics will include installing deer fencing, using deer spray, and which plant materials are more deer resistant than others. Composting is a wonderful way to help the environment and help your family. Learn how to begin composting with Hilltop Farms experts. Hilltop Farms will once again offer "Mother's Day Tea on the Porch." Come over and enjoy a cup of tea or coffee from the Hilltop Farms café and let mom choose her favorite plant or garden decoration as a gift. Hilltop Farms will announce the winner of our Garden Makeover Contest at this event so be sure to enter to win and then join them to hear if your garden is the winner! Visit http://www.hilltopfarmsmarket.com for more information. Questions can be directed to 914-358-1531.